As forecast, snow showers started off light this morning in Hampshire and continued through the morning. We are expecting more accumulations through the day, with accumulations of up to 10cm by the end of the day, particularly in the west and north west of Hampshire. Further snow is expected on Friday, giving a further 2-5cm on top of Thursdays snow. Temperatures all through Thursday and Friday are likely to be extremely cold meaning that ice formation will be a significant risk and we are not expecting any let up in the freezing conditions probably until Sunday, so the fallen snow will re-freeze at night, and hang around for a while. With the extremely cold road temperatures, ice formation is a real issue for us as well as snowfall. It is worth noting that, as temperatures fall below -5c, salt loses its effectiveness and, given the extremely cold temperatures, all road users are advised to take particular care. We are also advising everyone to check their onward travel arrangements given the disruption to air travel and public transport. The priority 2 and community routes were gritted again yesterday and last night we did a further double run on the Priority 1 routes. We will be spreading pre-wetted salt/brine ahead of the snow to ensure the maximum salt is in place, given the forecast is for increasing winds which would potentially blow away dry spread salt on exposed stretches of road. This morning snow ploughs were fitted and the gritters are running continuously on the Priority 1 network until we are confident that routes are appropriately passable with care. Highways England are also be active on their network to keep the strategic traffic routes open, though the tragic accident and resulting closure of the A34 is expected to cause delays in the area throughout the day. With further snow and freezing conditions forecast from mid afternoon and through the evening, we will maintain our focus on the Priority 1 routes to ensure that the main routes remain passable for tomorrow morning. Salting routes are available online. 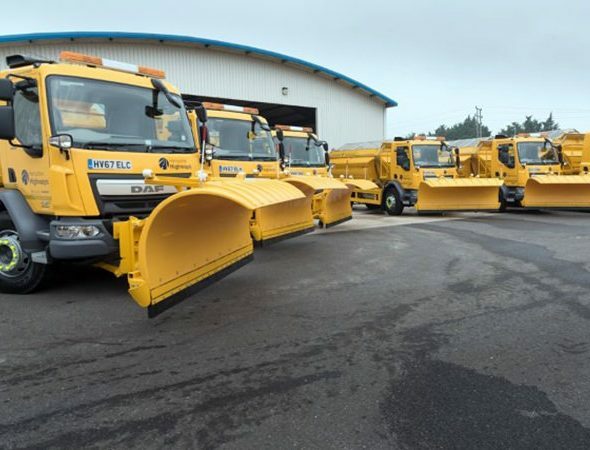 Follow @Hantshighways on Twitter to find out when the gritters are going out. The County Council’s 3000 community salt bins will also be a vital resource for local communities to treat neighbourhood roads and footpaths, but not for use on private drives. It is important to remember that a little salt goes a long way and it is unlikely that we will be able to replenish these salt bins during the snow as our priority will be to keep the main road network open. Therefore we are advising those using salt bins locally to follow our guidance. The County Council has made plans to maintain public services and district colleagues will be assisting with treating public areas such as town centres and busy footpaths. The County Council has issued a reminder to schools to ensure they are prepared to deal with snow and ice, including advice on maintaining a supply of salt on each site and clearing paths and entrances to ensure they can operate safely during bad weather. Parents are advised to check the website in the morning as a number of schools have already advised on changes to their normal arrangements. If anyone is worried about an elderly neighbour or relative, they should call Hampshire County Council’s Adults’ Health and Care team on 0300 555 1386, during the week in working hours, (8.30am to 5pm, Monday to Thursday, 8.30am to 4.30pm Friday) or call 0300 555 1373 out of hours and on weekends and Bank Holidays.